Following multiple reissue sets of Galaxy Laser Team mini figures over the past couple years, the latest incarnation of these classic space-fantasy toys is has arrived, and it's the biggest re-release to date. Literally. 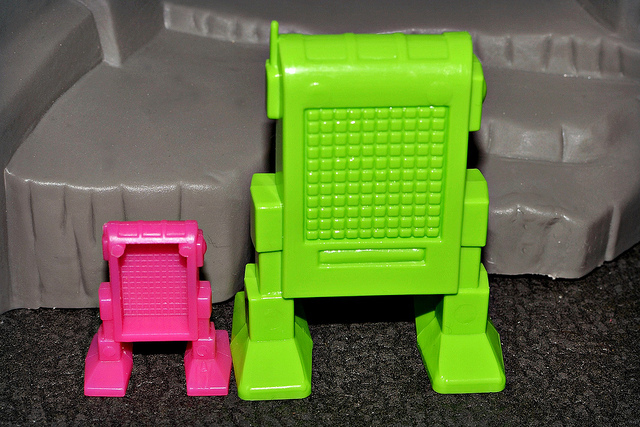 Earlier this year the old molds were unexpectedly found for the "jumbo" versions of these figures (which measure up to 4.75 inches tall), and brand new sets have been made! According to the product description for this release, the super-sized versions were originally produced by Tim Mee Toys' parent company, Processed Plastic, in 1979 as a follow-up to the standard 2-inch mini figures released the previous year. They were typically sold under the name "Star Patrol." 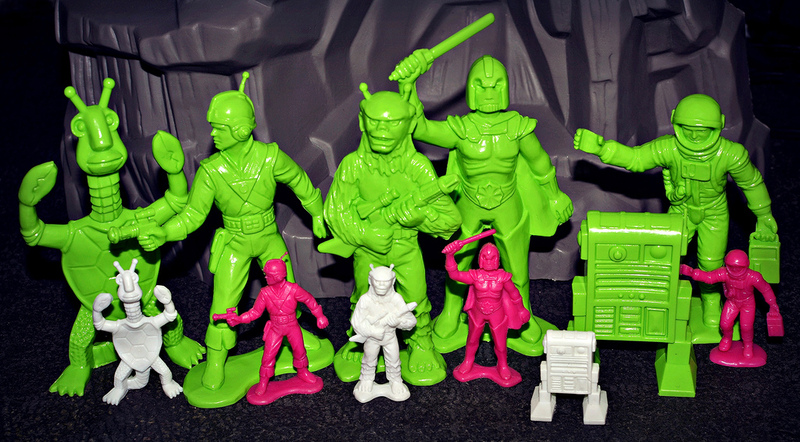 The 2014 reissues have been produced in bright green, with each bagged set consisting of six figures: the Chewbacca-esque alien, the space hero, the stubby robot, the Vader-esque villain, an astronaut, and of course, the ever-awesome lobster-turtle alien. The paper header on the sets features the same type of fun, colorful artwork that we've seen on the previous Tim Mee reissues. There are a couple of the mini figures that didn't make it into the jumbo set, including an astronaut in a different pose and the space heroine standing by her console. 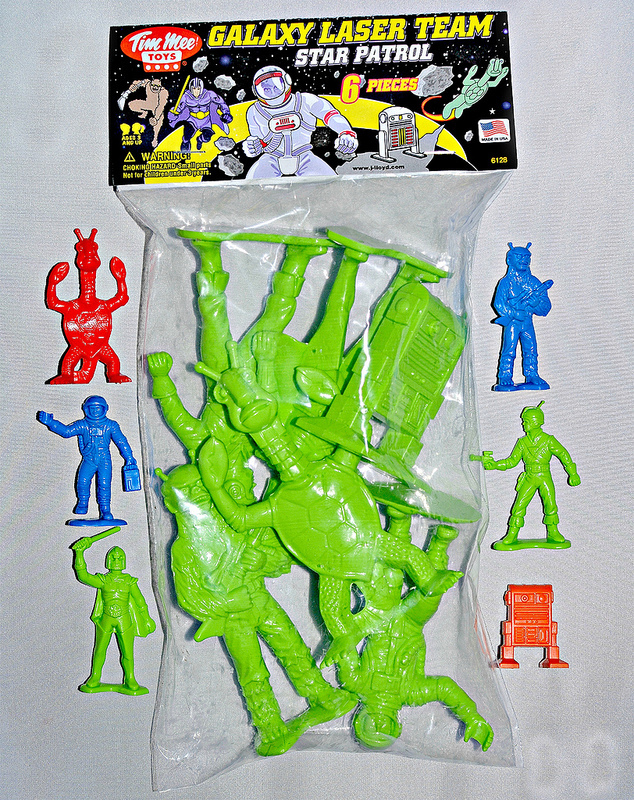 While the absence of the space-lady is especially noticeable, from what I have read she was never produced in jumbo size and a mold doesn't exist, which explains why she isn't included. When you first get these figures in hand, you might be surprised by just how much larger they are than the mini versions. I know I was. As you can see above, they pretty much tower over them. These figures have a really solid feel to them, and are made of a hard and sturdy, yet somewhat flexible plastic. The details come through crisp and clear. It looks and feels like a high quality set. I was especially excited to get a giant version of the lobster-turtle, as it's long been one of my favorite non-articulated figure sculpts. I immediately got the urge to pose him along with the smaller versions in all of the different colors that I own, and the result did not disappoint. 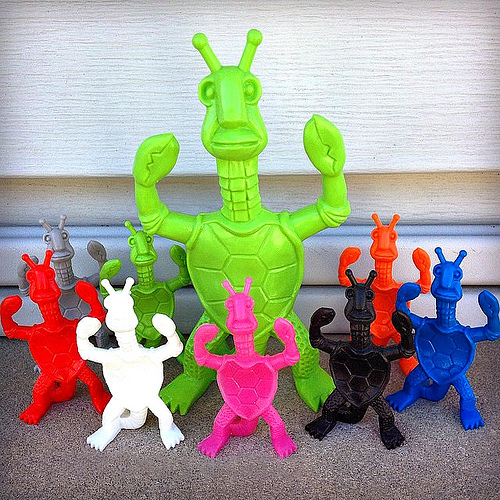 The lobster-turtle overlord has found his minions! We can only hope that more colors will continue to be produced so they can join the ranks. There will never be an army of lobster-turtle aliens that is too big. Aside from that classic weirdo, the super-sized figure I dig the most is the R2-D2-meets-mailbox robot. I don't know exactly what it is, but there's just something about this particular sculpt being in the larger scale that makes it extra fun. I love the textures on on it, and the fact that the jumbo version features the solid, fully-sculpted back instead of the hollow back that is seen on most of the mini versions. 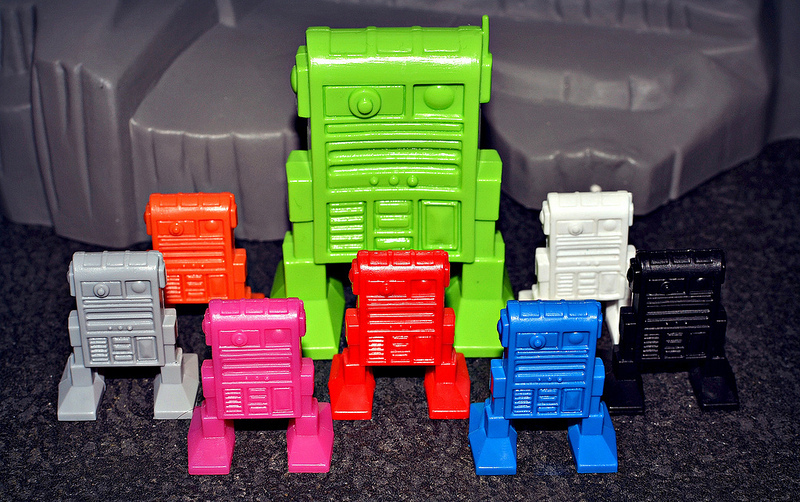 If you're a Galaxy Laser Team fan, you'll no doubt want to add this set to your collection. And you can do just that via Amazon, where each set of six costs just under $16. Hopefully we'll see some more colors in the future. I'd love to see some glow-in-the-dark colors, or maybe a snazzy neon pink set. I have the little white "turtle-crab" Star Patrol figure, still, from back in the day... If those giant-size reissues were gray, white, or black instead of neon-green; I'd pick up a set... Or even glow-in-the-dark, like you said- that would be SWEET! They did a black and gray set a couple years ago, but it was the standard mini versions. I had some of the originals as a kid and I think my grand parents might of gotten them from a Wolworths store along with a toy space gun and helmet I could ware too. I love these things! I still haven't pulled the trigger on them, I need to save monies and my wife would kill me if I purchased more toys, lol! That's why you don't tell her. ;) Just kidding. They are awesome though--hopefully you can grab a set eventually. 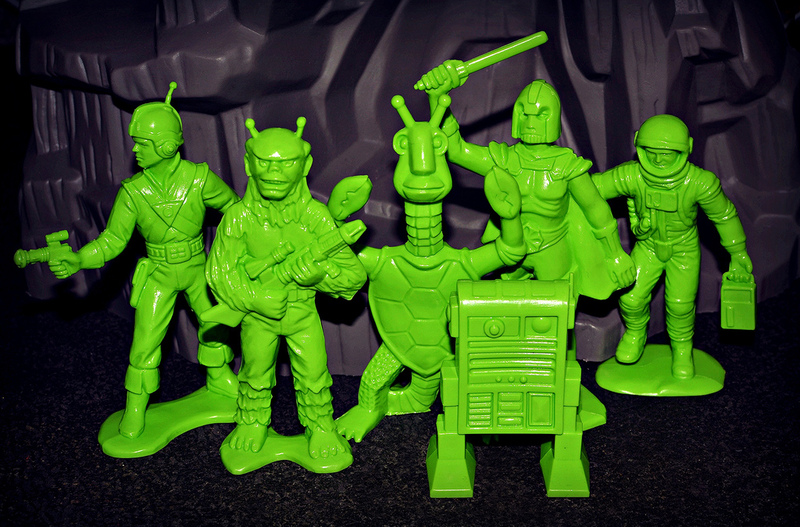 I had a few of the alien and robot only. Maybe I had that message from space set? I never knew where they came form. I bought these jumbo figures in the early 2000s, and was puzzled til today; they have no markings, no date, anything that could reveal their origin. Now, the ones i own are of semi-rigid plastic, yellow, red and cream. My wife, then girlfriend, never liked them. Now, we moved into a cool loft, so I put them over the hanging wood panel that holds the lights over the table kitchen... and she loved them!